This animation tried to be as realistic as possible to demonstrate the role of the auxiliary subsystem progression carburetor. The function of the auxiliary idle system and progression is to feed the engine at lower revs, when the throttle butterfly is closed or slightly open. The auxiliary idle subsystem provides air-fuel mixture to keep the motor running at idle. The need to increase the engine speed kicks in the auxiliary system of progression of the carburetor. With the opening of the throttle plate, which is controlled by the accelerator pedal, air starts to be sucked directly by the carburetor body, impoverishing the mixture provided by the auxiliary system idle. In this case, to smooth the passage of the idle to a higher speed, there are the so-called ‘progression holes’ through which the mixture is injected into the main air stream, as the butterfly throttle will open and discovering these holes, adding this extra rich mixture compensate the inlet air flow. The diameter of the top of the carburetor body is larger than the bottom part. This implies that the areas are different. As the flow rate is practically constant in all cross sections – body mass -decreasing diameter at the lower part is compensated by the increase of the flow velocity in this region. The pressure fluid exerts on a surface is inversely proportional to its speed -Principle Bernoulli- thus the pressure at the bottom of the carburized, near the holes of the auxiliary exhaust system and idle progression is less than the pressure on top of the carburetor, next to the vent. 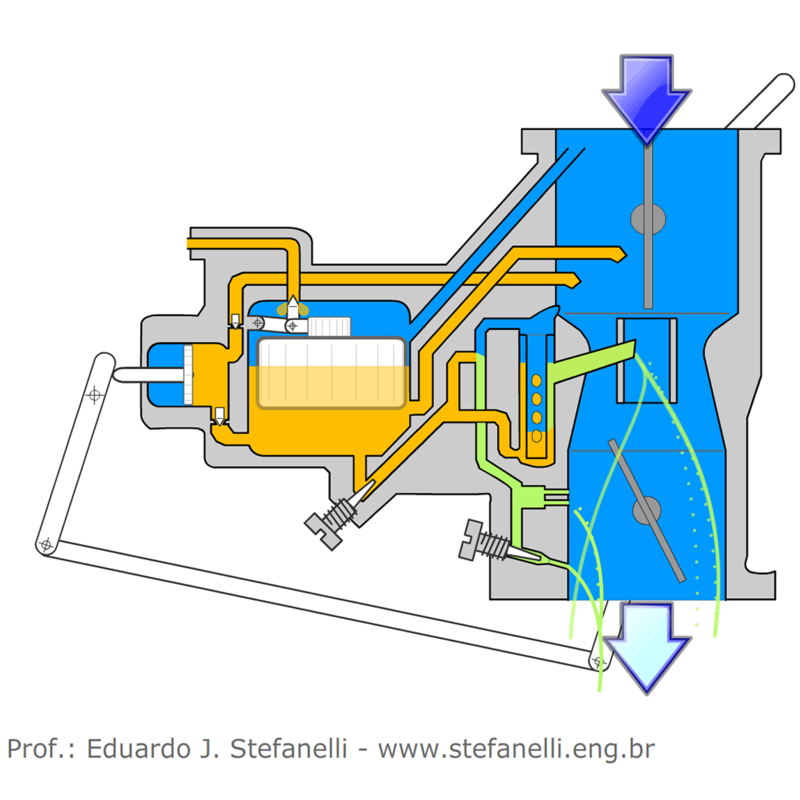 Thus, a flow of air is forced through the duct, trying to balance this difference, it drags the fuel, which is also subjected to increased pressure, as its vent is at the top of the carburetor. Dodes by an orifice, the mixture is injected into the main flow. Note that I used the word ‘injected’ and not ‘vacuumed’ because the action is in the mix.